15/05/2017 15/05/2017 J&C Admin 1640 Views Huaphan province, Lao coffee, LTD, Yuni Coffee Co.
Lotteria will open its first outlet in Laos on Sept. 9, it announced on Sept. 4. This is the first time a South Korean company has entered the Southeast Asian country. Starting with the two-story store in the capital city of Vientiane, the fast food franchise will …. The negative impacts from banana plantations in Laos could be outweighing the benefits. The findings were outlined in a study undertaken by the institute in cooperation with the National University of Laos …..
Nowadays the most popular food for diners looking for a quick and satisfying meal is always a dish of noodles, especially at lunch time, and Vientiane is full of big and small restaurants serving up this traditional dish. This is the food of choice for people who don’t want to cook, and somehow their thoughts always turn to a …..
CP LAOS, a subsidiary of Thailand’s listed Charoen Pokphand Foods, is set to increase pig-breeding stocks at commercial piggeries in Laos from some 7,000 to more than 12,000 this year in order to boost the number of piglets. The move reflects increasing demand in Vientiane. This expansion should see the number of piglets born increasing from 160,000 to …. Vientiane is notorious for its lack of addresses and bad directions and only a few restaurants in the city offer any form of delivery service. How many times have you wanted to order something different but ended up with a Thai style pizza for lack of other options? As huge fans of glutinous rice, which is sticky rice’s formal name, we’re here to clear up a few things. For starters, sticky rice is distinct from common white rice; it’s not merely …. She was involved in the collection and conservation of the …. There’s a charming little oasis in Vientiane that many of us visit to escape the doldrums of life…our little heaven of sorts where we get to learn to love life all over again. Tucked away at the end of Dongpalane, Love Life Ice Cream (or LLIC, as I conveniently call it) is the brainchild of cookie school teacher Fleur Varenne, a French-British transplant in Laos. If you haven’t been to LLIC, get ready for a surprise. The ambience is bright, cheerful and …. Pizza Company, a Thai franchise restaurant chain, plans to open another branch in Vientiane this year after achieving major business success over the past few years. Friends International announces the new location and trading hours of Award-Winning restaurant, Makphet in Vientiane, Laos. Now open 7 days a week ! Set in a French colonial building, Makphet is a family-friendly restaurant with a warm vibe. It features a spacious dining room and large garden for kids to play. The restaurant offers a mix of dining options; artisanal wood tables, cozy banquet seating, communal tables fashioned from reclaimed wood, and comfortable wooden chairs. An outdoor seating area in the lush garden is ….. It was a breezy Saturday evening and we found ourselves at the Thatdam red light area at the brink of dusk. We looked to our left and there stood a humble house that carried a silent yet majestic aura reminiscent of a past French colonial era that dared to refuse the winds of time. While the exterior edifice of the restaurant was French in nature, the interior whispered soft Lao overtones. We were quite taken aback as we witnessed the French façade fade away as our vision gave way to the …. Malaysians, besides being weighed down by obesity and diabetes, according to an Oxfam International report on worldwide food quality, also consumed food of poor nutritional diversity. The just released research by the UK-based poverty and disaster relief group ranked Malaysia 44th out of a list of 125 countries. Malaysia has also been ranked the fattest country in Southeast Asia and the sixth in the Asia-Pacific Region. In Southeast Asia, Malaysia came in second behind Thailand, which ranked 42nd worldwide. Its neighbours, The Philippines (67th), ……. Chinese businessmen taking advantage of Laos’ development boom are fueling demand for great, authentic regional cuisine. Chinese businessmen arrive in Vientiane and many settle in the Chinese enclave just outside the city, Sanjiang Cheng (Three Rivers City). Here, they purchase Chinese goods, communicate in Mandarin and, of course, eat traditional Chinese food. In other countries, Chinese food is heavily influenced by the host country’s native ingredients and preferences. In Laos, however, Chinese ingredients are often easy to acquire. 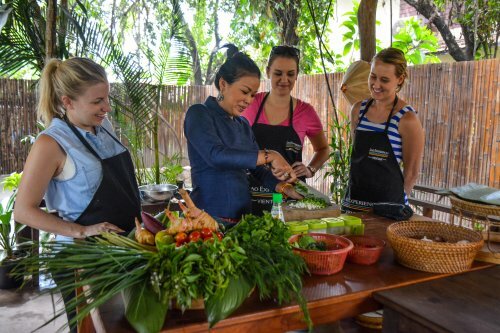 These factors combine to make Vientiane one of the best places outside of China to sample China’s regional cuisines. You just have to know where to find it: …..
Laos, Thailand, Cambodia and Vietnam are trying to save dogs, supposedly man’s best friend, from restaurants in Vietnam, where they have most favoured meat status. 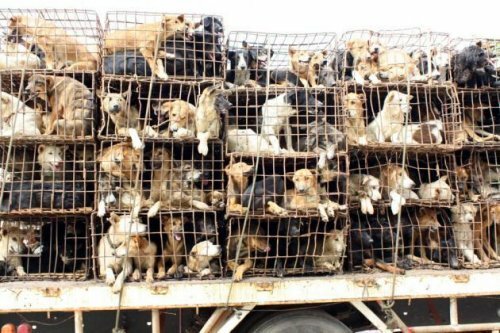 The four governments agreed in principle to put an end to the trade in dogs for human consumption at a recent meeting in Hanoi, with a pledge to interdict the trafficking of canines from one country to another for the next five years. The move, if successful, could save an estimate five million dogs from being slaughtered and eaten each year, according to …..
A new organic market opened at Chao Fa Ngum Park on Monday to respond to the increasing demand for healthy and safe agricultural products in the capital. The opening ceremony was held on Monday evening at Chao Fa Ngum Park and saw many stalls displaying organic products that have passed quality control tests through Lao organic certifications. Organic products such as vegetables, fruits, rice, and artisan products were available for purchase. The market will be open every …. The UN Food and Agriculture Organisation (FAO) has cooked up a possible solution to the global food crisis by encouraging people to eat more insects. Flicking through their report will bring few surprises for Laotians who, along with people elsewhere in Asia, have been eating insects for as long as anyone can remember – either as snacks or as full-blown meals. But the FAO has also confirmed that bugs are highly nutritious, rich in protein, vitamins, fibre and minerals. Among the healthier snacks consumed in Laos are a wide variety of grubs and bugs, usually fried in oil. The average Laotian knows exactly what can be eaten and what cannot, and at what time of year what particular insect Mother Nature will serve up in abundance – and on what sort of plant it likes to feed. The holiday season is a time to bond with family and friends. But for many, it is also a time for overeating and weight gain. So how can one get rid of all that junk from his system? Through detoxification, said raw food practitioner Margo. She said drinking lots of water and fresh fruit and vegetable juices, coupled with rest and exercise, will help flush all the salt, oil and alcohol out of the body. “Our body is like a car. You bring it to a shop to clean it, the tubes and the pipes. It’s the same with our bodies. We drink fresh juices and…..
“There is something very unique about this restaurant,” I told myself the first time I walked into Xang Ngun. The grey-coloured tapestry covered in black flowers. The black metallic wall covered with mirrors. The mirror-covered ceiling. The modern-looking black chairs sitting under beautiful black and white ceramic tables. And a stand-out-flashy red bar lies in back, protected by two silver elephants, or in Lao, two Xang Ngun. It is all quite baroque really. After having tried different plates and hors d’oeuvres, I can truly say the food is just as unique as the restaurant’s design. Although the food is based on Thai and Lao cuisine, Arnaud Poire, the head-chef and partial-owner, has found a way to add his own special touch …. Lao drinking water companies are reviewing safety standards following a rash of complaints. Companies that sell bottled drinking water in the Lao capital Vientiane have pledged to upgrade the quality of their supplies following public complaints about safety standards in the industry and surprise government inspections on water production facilities. During the September-October period, the Drinking Water Association in Vientiane received numerous complaints of unclean water in bottles consumers had purchased from local stores. With Germany winning the first 2 group matches of Euro 2012, I was quite ecstatic and impressed with anything German. Hence, this led to my craving for anything of German nature which subsequently led me to the Berliner Bär Pub for one of my dinners. We decided to have a go at the Berlin curry wurst with potato salad and pork knuckle with French fries and sauerkraut. While awaiting our dinner we decided to also quench our thirst with German beer. I did notice that the walls hardly displayed anything German unlike typical restaurants. Neither was there any German music or other paraphernalia. However, after a few sips of fine Paulaner beer they hardly made any difference as I was here to relish the triumph of Germany. After both our dishes arrived I immediately tucked into the …..
Conveniently located at the Samsenthai road, Sabaidee Shabu Shabu is a buffet restaurant where you can eat as much as you would like. Most of the food comes to the customer through a conveyor belt with small plates carrying vegetables, fish and meat. The quality of the food on the conveyor belt is good and even the generally more expensive fish, seafood and shrimp is widely available. Cafe Nomad opened around June this year and so far the quiet little cafe tucked away near the Thai Consulate hasn’t made itself known to the wider community. But that’s the way owner Sanghyun Jung likes it. He doesn’t want hordes of people tromping around his artistic little Vientiane cafe; he seems to want to keep things on the down low and entertain a small but growing group of regulars who come for the coffee and stay for the brownies (and the free wi-fi). Fuji is the latest in a series of Thai restaurant chains to open a franchise in Laos. After much fanfare and an action-packed, star studded Grand Opening, I went to visit the restaurant last week to see what the fuss was all about. From the moment I walked in the door I found that it consistently and overwhelmingly exceeded expectations, from the first kimono-clad waitress to the last mouthful of lightning-fast sashimi. One place that I overlooked for years and only recently came to know and love is Via Via. The atmosphere reminds me somewhat of Vang Vieng; busy and bustling, full of tourists and giving quick in-and-out service. Tables stretch from inside the restaurant all the way to the pavement outside and patrons are kept cool by standing fans. The pizza bases are made out back, but toppings and baking is done in the middle of the restaurant in full view of customers so you can literally watch your pizza being cooked. The new L’Adresse really is an address you’ll want to look up for your next night out. In complete contrast to the previous locale, the new design sees a more modern, casual dining space which is conducive to conversation rather than stifling it. Painted brick interior walls part at the kitchen where patrons may view the chef, Tinay, hard at work in what looks like a top-notch and professional kitchen. Often forgotten when people wrack their brains as to where to eat, Patuxay Cafe opened its first outlet on Sibounheung Road last year and it has been the restaurant of choice for many a business lunch ever since. The cafe serves a wonderful variety of sandwiches, salads, cakes and other baked goods and their coffee is very nice, as is their broad range of fruit shakes, smoothies and juices. As if by providence, shortly after our survey results showed Pimphone Market to have the best coffee in town, the owners of the market’s coffee shop extended the cafe from a small corner in the market to the full upstairs floor. The area that formally housed Chez Phillipe (who has now opened Bistro 22 opposite the Catholic church) is now the latest coffee shop in town – ‘Benoni’ – which has become a new meeting point for expats and locals alike. Common Grounds Cafe and Bakery is a newly opened cafe located in the middle of town on the road leading to Senglao DVD between Inter City Hotel and La Gondola. I visited it in the morning last week and even then it was attracting quite a few customers, mainly tourists, but also one expat mother who let her kids loose on the indoor playground. A word that came to mind upon my first impression of the place was ‘jomesque’: because it bears a huge resemblance to the original and still dominant Lao cafe chain. This fruit is common in Southeast-Asia and is used both as medicine and food. Research has confirmed that the beta-carotene (vitamin A) in the fruit is highly bioavailable and is even more than in carrots. Usually people open the fruit and take out the red flesh that sticks on the the coin size seeds. It is actually pretty tasteless, so usually people mix it with rice or juice. Whilst there are a growing number of Japanese restaurants in Vientiane, Ramen fans will be pleased to know that there is now a restaurant devoted entirely to Ramen! Newly opened Sagano Ramen and Cafe is situated above Xayoh Grill House opposite the cultural hall. Sagano is in its opening week and most definitely going strong. I went there during the lunch rush and found the place crammed with patrons waiting to try their first bowl. Vegetarians beware: Xayoh Grill House is truly a meat-lover’s paradise! This restaurant has just been refurbished and rebranded as a Grill House rather than a cafe. And boy am I happy to hear it! There are times when us expats really just crave a big hunk of meat to sink our teeth into, and Xayoh Grill provides just that. One dining experience which is incredibly popular within the Lao community but not so well known amongst the expat community is Sin Daat (literally ‘seared meat’) or Lao Barbecue as it is called in English. The concept seems be an offshoot of Bulgogi, or Korean Barbeque, which has developed into its own cuisine using many Lao elements.